Planning meals for your family has always been a difficult task. Now more than ever, with so much emphasis placed on proper nutrition, parents’ heads are spinning when trying to get dinner on the table. There is No Time to Cook! 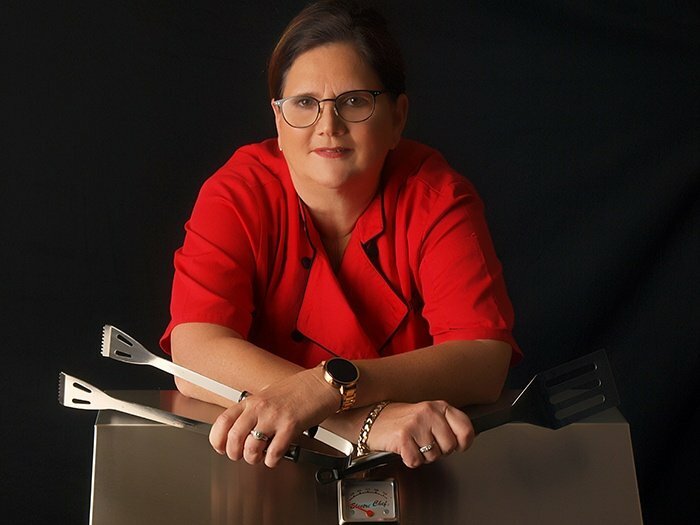 The creation of cooking shows such as, “Cooking Channel” and “The Food Network” have made deciding “what’s for dinner?” easier by giving the home cook ideas. The only problem is family dynamics have changed and truly there’s very little time to make these amazing recipes. With both parents working and children participating in extracurricular activities, food choices must be easy, fast and nutritious! A Real Delicious and Nutritious Fast Food! The 21st century has created an information explosion in almost every facet of our lives, including what we eat. Omega 3’s, clean proteins, non-GMO’s are words rolling off even our children’s lips. 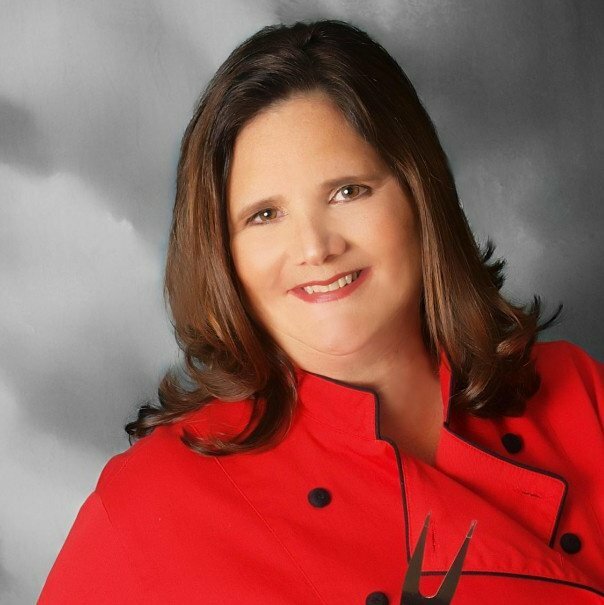 Don’t get me wrong, culinary education is a good thing, but we have to help today’s families find fast, easy and nutritional recipes to put on the table. 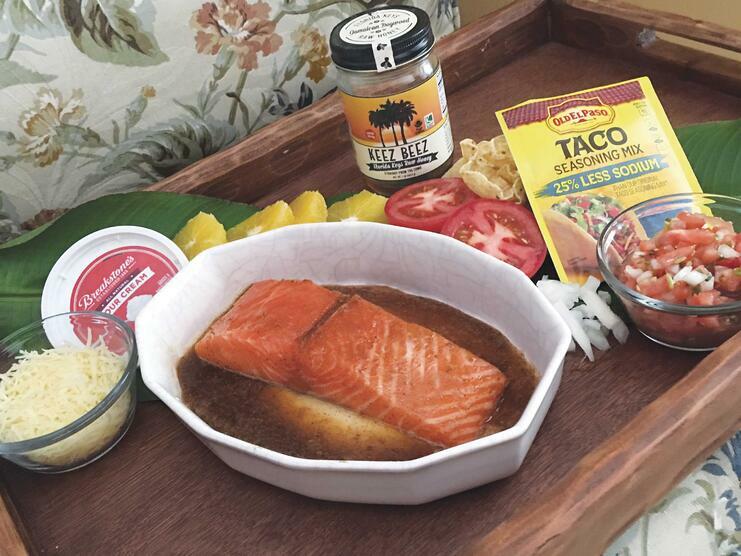 One such recipe is my Grilled Salmon Seafood Nachos with a Citrus Brown Sugar Glaze. 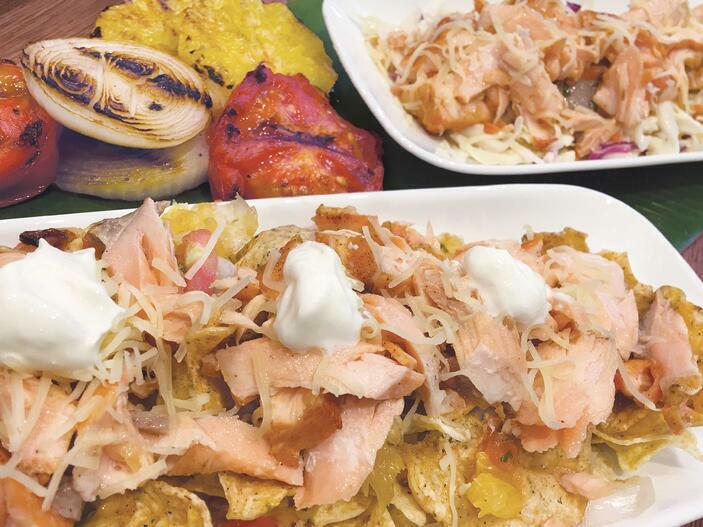 Did You Say Grilled Salmon Nachos? Getting children to eat seafood has always been a difficult task. I believe if you can get your younger children, ages 4-7 years old, to begin eating or just tasting food made with flavors they are accustomed to, it will help make eating habits, later in life, easier. This is why I suggest letting young children participate in the meal preparation. Showing children the ingredients they like, such as brown sugar (used to make cookies!!!) and chips, may help enticing them to try new things. The salmon in this dish can easily be substituted with chicken; however, the more you substitute, the harder it will be to create a palate open to new tastes. Place first four ingredients in a medium bowl and mix together with a small whisk.Remove salmon filet from packaging, remove pin bones*, rinse, pat dry and baste skin with canola oil or spray with canola spray. PRO TIP: Larger pieces of salmon (with skin-on) tend to want to curl up, this is why I suggest cutting the salmon into fillets. To prevent the larger cuts of salmon and other thick skinned fish from curling up on the grill, score the skin of the salmon. To do this make three diagonal cuts across the back one way and three diagonal cuts the other way, this will create a diamond pattern. Careful to only cut the skin and not the flesh of the salmon. PRO TIP: Pin bones* are very small and you can ask you fish market to remove them, however, if you run your finger across the flesh of the salmon and feel one or two, grab a pair of tweezers or a needle nose plier. I have a pair of needle nose pliers in my knife drawer just for fish!! Please don’t just steal the ones from the garage without cleaning them first… grab the tip of the pin bone and pull them out in the direction at which they are in the salmon for the smoothest results. Place salmon filets in a shallow dish, skin side down and drizzle the brown sugar mixture all over the salmon avoiding the bottom if possible. Spray your ElectriChef grill grates with Canola oil then preheat your Electric Grill to 500°F. Using tongs, carefully place salmon filets skin side down. NOTE: The salsa recipe follows. If your children love asparagus and oranges, I suggest adding the asparagus and the orange slices to the grill at this time. 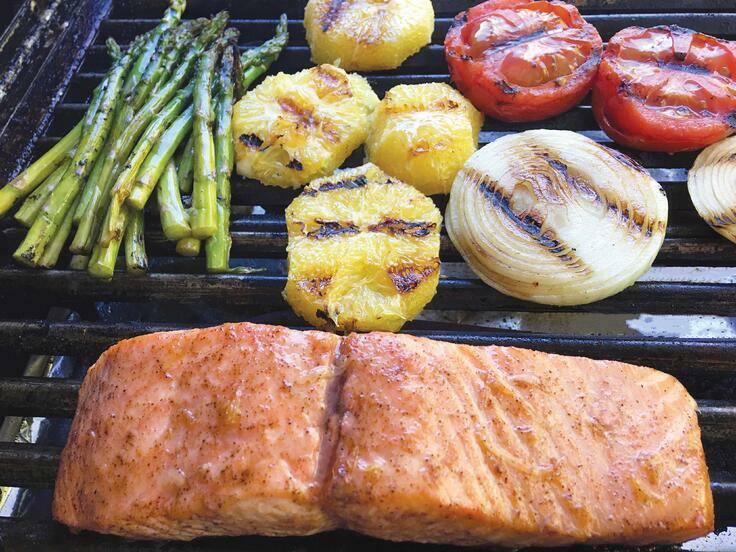 Leave the salmon filets alone on the grill for 8-10 minutes depending on the filet thickness. PRO TIP: While the salmon is cooking you will begin to see small amounts of juice coming from the salmon, this is just fine. The salmon is done when the flesh flakes easily. 8-10 minutes is really all it should take, the fish, just like meat and poultry continues to cook even off the grill. Once salmon, oranges, tomatoes, asparagus and onions are finished, remove everything to a flat dish. Chop the vegetables and oranges for your salsa and transfer salmon to a separate dish or cutting board to remove skin and flake with a fork. NOTE: Salmon skin will appear to be charred, I discard the skin. Many people find this to be a delicacy, diner’s choice! Place chips on plate, add salmon, salsa, grated cheese, sour cream and enjoy! Chop 2 of the 4 tomatoes and add to a bowl with the lemon juice, ½ the olive oil, jalapeño, cilantro, cumin, and salt. Let rest. Spray your ElectriChef grill grates with Canola oil then preheat your Electric Grill to 500°F. Use remaining olive oil to baste the onion rings and halved tomatoes and place them on the Electri-Chef Grill. Run asparagus under water for moisture and place on grill next to tomatoes and onions.Grill vegetables for about 4 minutes on either side. Remove from grill and allow to cool.Chop grilled vegetables and add to existing mixture. Stir well and serve! Pin bones: Long fine bones found down the center of fish fillets such as salmon fillets. Just below the surface of the fish's flesh, there are needle-like bones you need to remove using tweezers or pliers. What's Next? Like that is recipe can be adapted for different pallets and health choices? Check out this other delicious Grilled BBQ Chicken recipe with a twist!